This weekend there is a really fun party going on – and you’re all invited! From 8 AM EST Friday, January 24 through 10 PM EST Monday, January 27 some of your favorite SLP bloggers will be having a Facebook Frenzy. During the Frenzy, you’ll get the opportunity to download over 20 freebies! Each will be different and they will target a variety of different topics! That’s right – 20+ free download that you can use in therapy! Participating is easy. 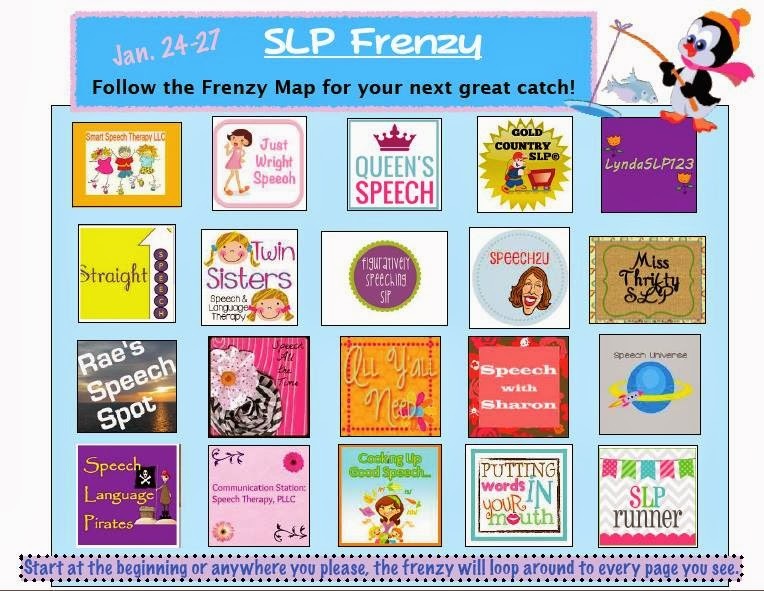 Just go to the Facebook page of your favorite participating blog; there will be a tab at the top that says “SLP Frenzy”. Click the tab. The tab will give you access to a Facebook only free download! It’s that simple!!! I hope you all grab some fun things to make this winter a little more bearable. Enjoy! « How Boardmaker Power Templates Will Change Your Life! The SLP Frenzy was great! Congrats!